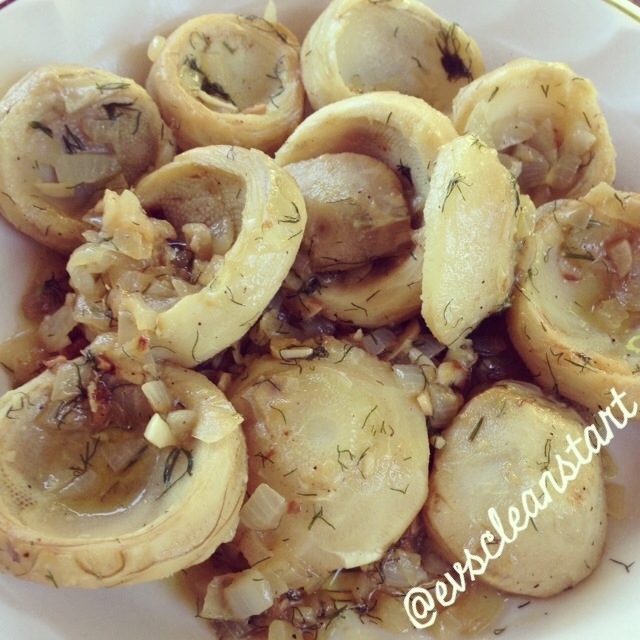 Ripped Recipes - Garlic and Dill Artichoke Hearts! Home » Recipes » Other » Garlic and Dill Artichoke Hearts! Garlic and Dill Artichoke Hearts! Keep artichoke hearts in the freezer for a super quick, convenient, healthy, and tasty side dish! Sautee 1 diced onion and 2 minced garlic cloves in 1/2 tbsp olive oil. Add in 1 bag of frozen artichoke hearts (400gram), 1 tbsp fresh dill, and 1 cup water, then cover and simmer until they become tender. If there is too much liquid, remove lid and reduce.